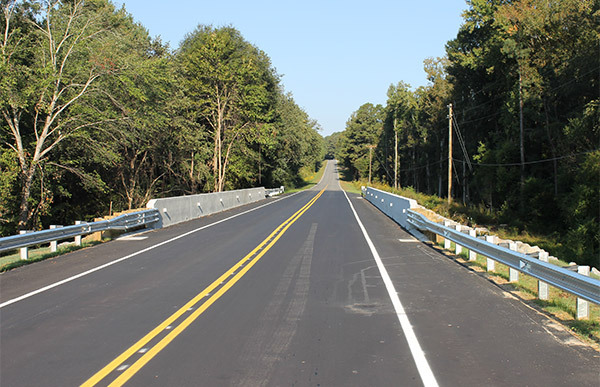 RS&H served as the lead engineer for Lee Construction of the Carolinas Inc., providing turn-key design services for 11 bridges for North Carolina Department of Transportation (NCDOT) Division 8. Services included roadway, hydraulic, and structure design, as well as maintenance of traffic, utility coordination, and overall project management. RS&H’s roadway, structures, and hydraulic engineers worked seamlessly to develop the most economical and environmentally sensitive solutions for replacing the deficient structures. Challenges included addressing roadway “overtopping” during major rainfall events and limiting traffic impacts to neighboring schools and emergency vehicles. The projects required diligent coordination with NCDOT Division personnel from preliminary design through construction to ensure that local knowledge of these projects was not lost and that all project issues are addressed. The NCDOT Division 8 and Transportation Program Management Unit have specifically complimented our team’s aggressive schedule and coordination efforts.